Stream anime episodes online for free, Watch One piece Episode 75 English version online and free episodes. Anime Episode guide One piece Episode 75 English dubbed A Hex on Luffy! Colors Trap! Mr. 3 is unsettled, that Zoro and Nami seem to be completely carefree since Luffy’s arrival. Usopp and Karoo face Mr. 5 and Miss Valentine, but instead of fighting, they let themselves be chased through the jungle. 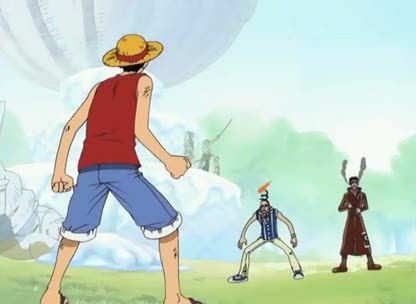 Luffy tries to destroy the wax pedestal threatening the lives of his friends, while Mr. 3 fights to keep it intact. Once Luffy sent the officer agent flying into the jungle, the captives find Luffy unwilling to help them, because Mr. 3’s partner, Miss Golden Week has him firmly under control with her emotion inducing paintings. Unable to catch Karoo and Usopp, Mr. 5 resolves to use his newest piece of equipment, a revolver, which he loads, instead of with bullets, with his explosive breath. 5 / 5 - 54 ratings.